The Drivers That Made History (approx 46 mins B&W/Colour). This film features drivers such as Georges Boillot and Felice Nazzaro in the early 1900s; Rudolf Carraciola and Tazio Nuvolari in the 1930s racing the ‘Silver Arrows’; Juan Manuel Fangio and Stirling Moss’ great rivalry in the 1950s and discussed in rare interviews with the two drivers; Jim Clark’s short but superb career; Jackie Stewart, a true racing legend who changed the face of Formula One; Niki Lauda, including a frank interview where he describes his thoughts at Mount Fuji when he retired, giving James Hunt the title; and finally Alain Prost and Ayrton Senna. There are exclusive interviews with Prost and Senna, who between them generated plenty of friction and their comments focus an interesting spotlight onto F1 at the time. Monaco: The Jewel in the Crown (approx 25 mins B&W/ Colour). The Monaco GP is one of the oldest and most prestigious events in the F1 calendar. 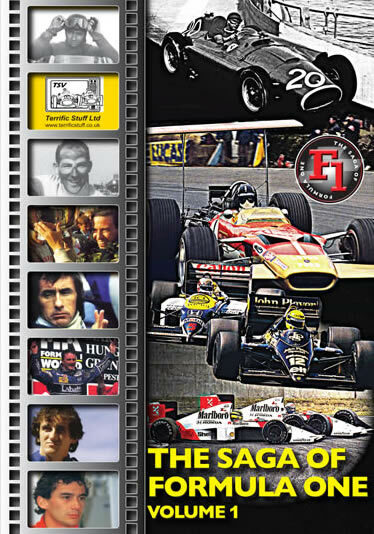 Using archive material this programme traces the history of GP racing in Monaco from its origins in 1929 to those sensational final laps of the 1992 race between Senna and Mansell. Past winners including Stewart, Lauda, Prost, Senna and Patrese discuss the characteristics of Monaco and recall their triumphs in interviews specially filmed for this programme. Some idea of the challenges it presents the drivers can be seen from the remarkable ‘on car’ footage shot from Ayrton Senna’s McLaren.